After nearly six months of working with local and state governments, West Virginia Northern Community College officials today signed the final documents giving ownership to the institution of the vacant Straub properties in downtown Wheeling. “All of us at West Virginia Northern are pleased we will be assisting the city of Wheeling in its economic growth while expanding the campus,” Dr. Martin J. Olshinsky, president of WVNCC, said. 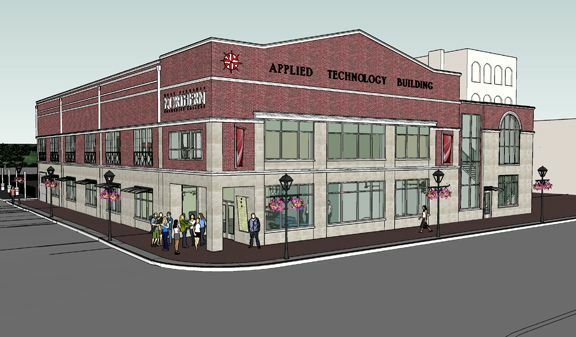 For more than a year, Olshinsky has presided over the college’s efforts to purchase the Straub buildings that were vacated when the auto dealership left the downtown for new facilities at The Highlands retail shopping complex off I-70 near Dallas Pike. Participating in the document signing were Olshinsky and Greg Stewart, Ohio County administrator. Expected to attend are Ohio County Commissioner Tim McCormick, WVNCC Board of Governors representatives and other Northern colleagues. It was on Feb. 24 of this year that the WVNCC Board of Governors approved a resolution calling for purchasing the three former car dealership parcels in downtown Wheeling for $1.05 million. Before any work could begin, however, the parcels' owner, the Ohio County Development Authority, had to approve the proposal as did the West Virginia Council for Community and Technical College Education. In addition, the college learned the West Virginia Board of Public Works also had to give its approval to the purchase. That approval occurred Aug. 10. The college had hoped bids for renovation work would have been sought earlier this summer. The properties include the Honda building, located at the corners of Main and Market streets at 16th Street; the Hyundai building located at Market and 16th streets; and a maintenance building situated near the Hyundai structure. The two main parcels already have parking lots. The college's current facilities include the B&O Building, situated across the street from the former car dealership, and the Education Center, the other main college building, across Chapline Street from the B&O Building. Straub had swapped its downtown structures and lots for property at The Highlands, which was developed by the OCDA which is why the development authority had the downtown buildings on the market for sale. Currently, the college is continuing to rent space in the Hazel-Atlas Building on Fifteenth Street which was sold last year to Youth Services System. Classes at Hazel-Atlas, which include those in heating, ventilation and air conditioning and in table gaming, will be moved when the Straub properties are renovated. The college also has plans to offer new industrial maintenance classes in the former car dealership. Steve Lippiello, Northern’s chief financial officer/vice president of adminstrative services, has explained funds for the purchase and renovation will come from state bond money approved by the Legislature in 2008. During the February Board of Governors meeting, Lippiello said the college had reviewed its options for expansion and learned it would cost more to build a new structure on an existing 17th Street parking lot than to renovate the Straub properties. The board then voted to approve the purchase. The college has retained the services of SMG Architects, Wheeling, for the renovation work. Olshinsky and Lippiello had noted previously that Barnes & Noble is interested in opening a book store in the Hyundai building that would be open to students and the public. Those plans are progressing but have not yet been made official.